I finally did a little astrophotography again last night, experimenting with my new Meade LPI-G color Solar System imager. This is the best shot I could manage, though I took four long-ish videos (yes, it takes live vids!) that saved in a weird format I can’t figure out how to open or edit, so that’ll be later. Talk about a series of challenges, though! 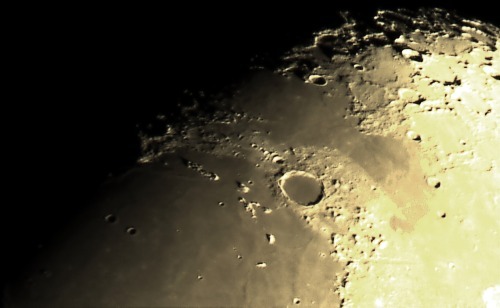 I wanted to use my apo refractor, because those are optimal for bright objects like the Moon, but when I pulled it out, I remembered I’d swapped its mount for a much sturdier iOptron… and the seller still hasn’t sent me the new controller and cables to make that function (and the mount is now in use with my solar telescope). OK. So I put that away and grabbed my handy-dandy 12″ Schmidt-Cassegrain. I’d forgotten that I’d taken it apart to install a big equatorial wedge (so it can better track the night sky), but discovered while trying to install it that the wedge expects a slightly different pattern of holes drilled (too old, perhaps? ), so I’d loosely re-assembled it. So I had to reassemble it, then haul it out into the yard. It’s a big puppy, btw. Anyhow. So now it was set up, and I plugged in the extension cord and power supply, got it aligned properly so it could track the stars, and set it to show the Moon. Handily, the mount tracks for crap, and the Moon slowly drifted across the field of view. Which was WAY too high-magnification (another reason I wanted to use the much-smaller refractor: Without an eyepiece, the focal length of a telescope and its focal-ratio determine the magnification of an object, and a 12″ f/10 SCT acts like a REALLY powerful telephoto lens. So now I went inside to grab my f/6.3 focal reducer, almost halving the magnification, so the Moon only sort-of overfilled the field of view. Ready to go! Next, I slid the little astro-camera into the eyepiece holder, plugged it into my laptop, and WOW! Live, streaming images from space! Except it still drifted across the field of view pretty quickly. *sigh* Well, at least Moon shots don’t need very long exposures, so you can get pretty sharp images even when the mount doesn’t properly track. Forgot to mention it was frakkin’ COLD. What stopped me from continuing to take images or try to improve the mount’s tracking is that my fingers were getting too stiff to work properly. 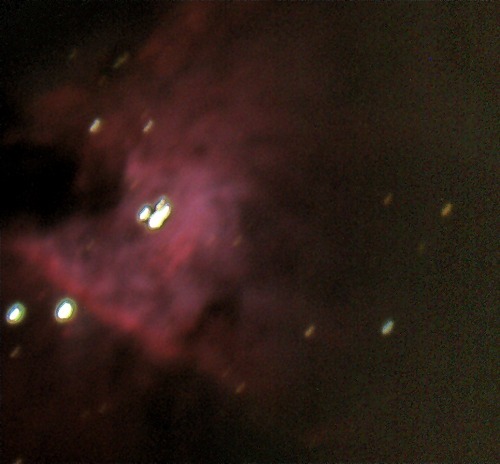 Oh, and despite the ridiculousness of trying to take a deep-sky photo through a telescope on a problematic drive on a moonlit night, I also tried my hand at photographing the Great Orion Nebula. I think this little camera will be AWESOME once I get to use it on a properly footed telescope. Check it out! The Moon shot, at least, is not too bad for my first time doing astrophotography in years, and the nebula shot shows great promise, especially considering I took this through a telescope that wasn’t tracking correctly while freezing to death and using new software I don’t really yet know how to use!